The development of novel compounds, hydrazones has shown that they possess a wide variety of biological activities viz. antimicrobial, anticonvulsant, antidepressant, anti-inflammatory, analgesic, antiplatelet, antimalarial, anticancer, antifungal, antitubercular, antiviral, cardio protective etc., Hydrazones/azomethines/imines possess-NHN = CH- and constitute an important class of compounds for new drug development. A number of researchers have synthesized and evaluated the biological activities of hydrazones. This review aims at highlighting the diverse biological activities of hydrazones. The emerging bacterial resistance causes a widespread problem for the treatment of various infections. Therefore, the search for antimicrobials is a never-ending task. Now-a-days a number of hydrazone derivatives have been developed and evaluated for their antibacterial activity. Aslan et al.,  investigated the antibacterial activity of sulfonyl derivatives (1). Certain steroidal hydrazines (2, 3) have been synthesized by Khan  which possess in-vitro antibacterial activity. Hydrazones bearing imidazoles (4) have been synthesized and screened for antibacterial activity against numerous bacterial strains by Abdel-Wahab et al. Palekar et al.,  synthesized different thiazolidinone derivatives (5, 6) using hydrazine hydrate and evaluated them for their in-vitro antibacterial activity. Wang et al.,  synthesized hydrazone derivatives (7) with significant antibacterial activity. Hydrazone derivatives containing transition metal complex (8) were synthesized and evaluated for antimicrobial activity by Babahan et al. Ozkay et al.,  synthesized novel benzimidazole derivatives bearing hydrazone moiety (9) with antibacterial activity against different bacterial strains. Khalil et al.,  synthesized hydrazone derivatives (10) and reported them as potential antibacterial agent. Hydrazone derivatives (11) synthesized by Abdel-Aziz and Mekawey  exhibited antibacterial activity with minimum inhibitory concentration (MIC) of 75 μg/mL. Good antibacterial activity of hydrazone derivatives (12) was reported by Bawa et al. Hydrazone derivatives (13), synthesized by Sharma et al.,  exhibited antibacterial activity against various bacterial strains. Antibacterial activity of certain hydrazone derivatives (14) was reported by Kendall et al. Jubie et al. synthesized hydrazone derivatives (15, 16) and reported them as promising antibacterial agents. Govindasami et al. synthesized and evaluated vanillin related hydrazone derivatives for their antibacterial activity. Compounds 17 and 18 exhibited good activity. Tuberculosis is a chronic, infectious and most prevalent disease all over the world. It is caused by different strains of the Mycobacterium tuberculosis. Lungs, liver and bones are most susceptible to infection. The activity of the newer agents is mostly tested against virulent H37Rv strain. Kamal et al.,  synthesized nitroheterocyclic based 1, 2, 4-benzothiadizines (19), which exhibited MIC of 1 μg/mL. Raja et al.,  synthesized hydrazone derivatives (20) and reported to have MIC of 6.25 μg/mL. Telvekar et al.,  developed benzofuran-3-carbohydrazide derivatives (21) with good anti-tubercular activity. Hydrazone derivatives (22) synthesized by Gemma et al.,  exhibited MIC of 6.25 μg/mL. Mahajan et al.,  synthesized ferrocene-based hydrazone derivatives (23) with significant antitubercular activity. 1H-indole-2,3-dione based hydrazones (24), synthesized by Karali et al.,  exhibited half maximal inhibitory concentration (IC 50 ) of 7.6 μg/mL. Hydrazones (25), synthesized by Eswaran et al.,  exhibited a MIC of 6.25 μg/mL. Hydrazones (26, 27) synthesized by Imramovský et al.,  based on isonicotinoylhydrazide, pyrazinamide, p-aminosalicylic acid, ethambutol, and ciprofloxacin exhibited MIC of 0.78 μg/mL and 3.13 μg/mL respectively. Hearn et al.,  synthesized anti-tubercular agents (28, 29) which showed MIC of 0.06 μg/mL and 0.20 μg/mL respectively. Nayyar and Jain  synthesized disubstituted quinolone based hydrazides (30, 31) with good activity profiles. Turan-Zitouni et al.,  synthesized thiazolyl hydrazones (32) having anti-tubercular activity with MIC of 2.5 μg/mL. 4-(adamantan-1-yl)-2-substituted quinoline based hydrazones (33) synthesized by Nayyar et al.,  showed MIC of 1.00 μg/mL. Imramovský et al.,  synthesized isonicotinyl derivatives (34) with a MIC of 3.13 μg/mL. Virus is a small infectious agent, which can replicate only inside the living cell of an organism. It infects all types of organisms-humans, animals as well as plants. El-Sabbagh and Rady  evaluated the antiviral activity of hydrazone derivatives (41) against hepatitis A virus. Tian et al.,  synthesized hydrazone derivatives (42, 43) as potential targets of human immunodeficiency virus-1 capsid protein. The half maximal effective concentration (EC 50 ) value of the agents was reported to be 0.21 and 0.17 μM respectively [Figure 1]. A number of hydrazone derivatives have been developed to overcome gastrointestinal disturbance and toxicity. Mohamed Eissa et al.,  developed anthranilic acid derivatives (44) and reported to have significant anti-inflammatory activity. Hydrazones containing 5-methyl-2 benzoxazolinones (45), developed by Salgin-Gökşen et al.,  were reported to exhibit good analgesic and anti-inflammatory activity. Khan et al.,  have described the anti-inflammatory activity of hydrazones derivatives of quinoxalinone (46). Rajitha et al.,  have reported good anti-inflammatory activity of aryl hydrazone derivatives (47). Benzylidene hydrazides (48) with prominent analgesic and anti-inflammatory activity, exhibiting percentage inhibition of 68.66 have been synthesized by Bhandari et al. Gökçe et al.,  reported the analgesic and anti-inflammatory activity of 6-substituted-3 (2H)-pyridazinone-2-acetyl-2-(p-substituted benzal) hydrazone derivatives (49). Moldovan et al.,  synthesized various hydrazone derivatives (50) with promising in-vivo anti-inflammatory activity. Kümmerle et al.,  developed N-acylhydrazone derivatives (51, 52) with ED 50 value of 2.3 and 1.6 mg/kg respectively [Figure 2]. World Health Organization defines cancer as the rapid creation of abnormal cells that grow beyond their usual boundaries and which can invade adjoining parts of the body and spread to other organs. Dandawate et al.,  developed plumbagin hydrazone derivatives (53) with high activity against breast cancer. Mohareb and Al-Omran  synthesized cyanoacetyl hydrazone with pregnanolone derivatives (54) active against multiple cancer cell lines. Aydın et al.,  synthesized and evaluated flurbiprofen hydrazide derivatives (55) against ovarian and leukemia cancer cell lines. Cui et al.,  synthesized acylhydrazones (56) and reported to have potent activity against the human promyelocytic leukemic cells (Hl-60). Al-Said et al.,  synthesized certain compounds (57) and reported to have in-vitro anticancer activity against human breast cancer cell lines MCF7. Liu et al.,  synthesized, evaluated acetyl hydrazone derivatives (58) for antitumor activity against A549, HCT11b, HepG2, PC-9 and A375 cell lines with an IC 50 value of 4-17 μM. 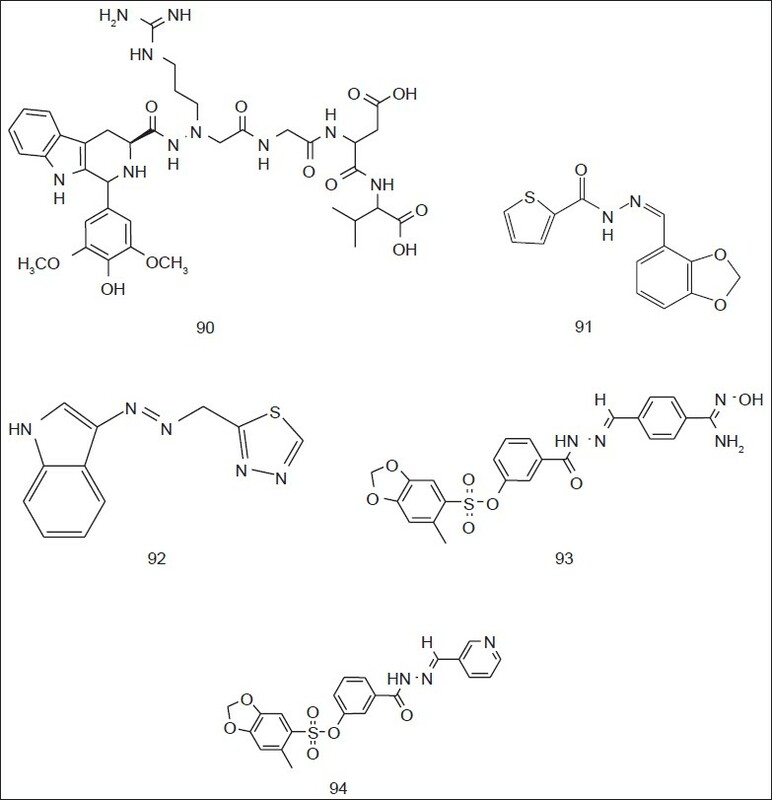 Aryl hydrazone derivatives (59) synthesized by Vogel et al.,  were reported to have an IC 50 of 6.7 nM against MDA-MB 231 and MCF-7 breast cancer cell lines. Xu et al.,  screened hydrazone derivatives (60) for kinase inhibition in different cell lines. Benites et al.,  synthesized hydrazone derivatives (61) and reported them to have significant antiproliferative activity. Hydrazone derivatives reported by Hayakawa et al.,  (62, 63, 64) exhibited marked PI3 kinase p110 α inhibition. Zheng et al.,  synthesized hydrazone derivatives (65) with the propensity to act against A549 lung cancer cell lines. Xia et al.,  synthesized various hydrazones (66) with IC 50 value of 3.33 μM against A549 lung cancer cell lines. Gürsoy et al.,  reported the anticancer activity of thiazolohydrazides (67) against prostate cancer. Despaigne et al.,  have described acetylpyridine and benzoylpyridine derived hydrazones (68, 69) as agents against brain tumor [Figure 3]. CNS diseases can affect either brain or the spinal cord resulting in psychological and neurological disorder. Hydrazones are reported to have activity against various disorders of CNS. Salgin-Gökşen et al.,  synthesized benzylidene hydrazone derivatives (70) and screened them for in-vitro monoamine oxidase inhibitory (MAO-B) activity for Parkinson's disease. Novel 2-Methoxy acyl hydrazone derivatives (71) synthesized by Cutshall et al.,  were evaluated for inhibition of phosphodiasterase 10A (PDE10A), a PDE responsible for neurological and psychological disorders like schizophrenia. Certain anticonvulsant bishydrazones (72) and hydrazones (73) were developed by Kulandasamy et al. de Oliveira et al.,  synthesized and evaluated the antidepressant activity of hydrazones (74). Gökhan-Kelekçi et al.,  synthesized hydrazone derivatives (75, 76), reported their selective MAO-B inhibition and hence useful in the treatment of depression [Figure 4]. Protozoa are a diverse group of unicellular eukaryotic organisms affecting human beings, especially in tropical countries. Aryl hydrazone derivatives (77) synthesized by Siddiqui et al.,  have been evaluated against HM1: IMSS strain of Entamoebica histolytica for anti-amoebic activity and reported to have IC 50 0.13 μM. Gerpe et al.,  described the anti-Trypanosomal activity of 5-nitrofuran hydrazones (78). Caputto et al.,  synthesized hydrazine derivatives (79) and reported to have activity against Trypanosoma cruzi (T. cruzi). Carvalho et al.,  synthesized Cinamic N-acyl hydrazones (80) with good anti-Trypanosomal activity. dos Santos Filho et al.,  synthesized hydrazone derivatives (81, 82) against T. cruzi. Trypanosomicidal activity of hydrazones (83, 84) has been reported by Porcal et al. Hydrazone derivatives (85) developed by de Aquino et al.,  have been reported to be useful in infections caused by Toxoplasma gondii. Caputto et al.,  reported the inhibitory activity of hydrazones (86, 87) against cruzipain-a major cysteine protease of T. cruzi. Malaria is a widespread infectious disease specifically of the tropics caused by Plasmodium. Antimalarial propensity of hydrazines (88) has been reported by Fattorusso et al. against D10, W2 and 3D7 plasmodial strains with an IC 50 value of 39.2, 79.0 and 11.0 nM respectively. Acharya et al.,  synthesized hydrazide derivatives (89) with an IC 50 of 160 nM/mL as against 280 nM/mL of the reference chloroquine [Figure 5]. Cardiovascular disease is a class of diseases that involve the heart and blood vessels. Despite the extensive research, it still remains the major cause of mortalities world-wide. Bi et al.,  reported hydrazone derivatives (90) to have potent activity against ischemia-reperfusion induced cardiac infarct size. Leal, et al.,  synthesized acylhydrazone derivative (91) and reported to have high anti-hypertensive activity. Antiplatelet drugs are the agents which decrease platelet aggregation and inhibit thrombus formation. Mashayekhi et al.,  demonstrated the antiplatelet activity of hydrazone derivatives (92) containing indole moiety. Hydrazone derivatives (93, 94) synthesized by Lima et al.,  were reported to inhibit platelet aggregation induced by collagen and thrombin [Figure 6]. The present review highlights the use of hydrazones as lead for the development of newer compounds. 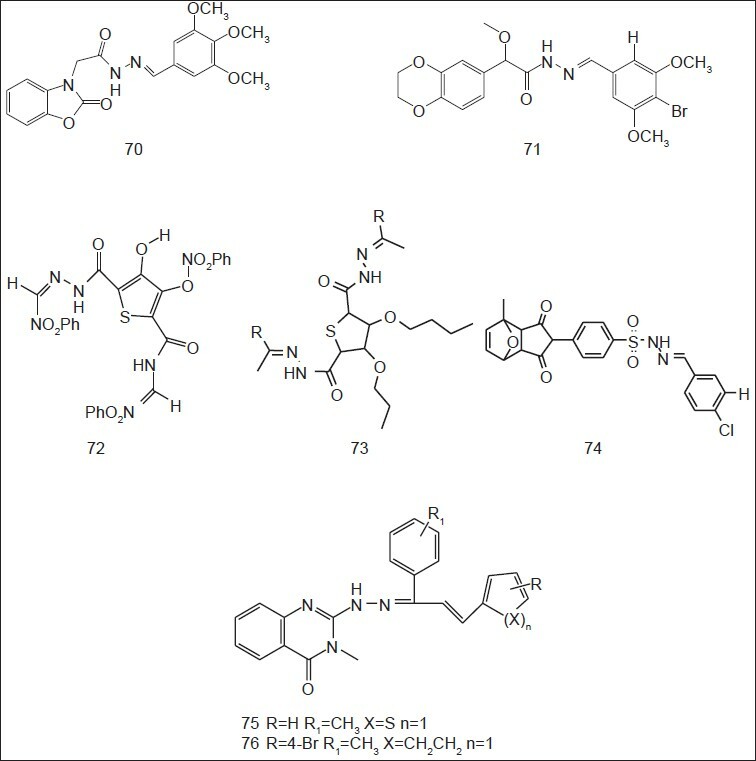 Biological activities of hydrazones include antibacterial, anticonvulsant, analgesic, anti-inflammatory, cardio protective, antiplatelet, anticancer etc., With proper designing, synthesis and structure activity relationship, a number of compounds can be developed with diverse biological activities. 1. Uppal G, Bala S, Kamboj S, Saini M. Therapeutic review exploring antimicrobial potential of hydrazones as promising lead. Der Pharma Chem 2011;3:250-68. 2. Rollas S, Küçükgüzel SG. Biological activities of hydrazone derivatives. Molecules 2007;12:1910-39. 3. Narang R, Narasimhan B, Sharma S. A review on biological activities and chemical synthesis of hydrazide derivatives. Curr Med Chem 2012;19:569-612. 4. Negi VJ, Sharma AK, Negi JS, Ra V. Biological activities of hydrazone derivatives in the new millennium. Int J Pharm Chem 2012;4:100-9. 5. Corey EJ, Enders D. Applications of N, N-dimethylhydrazones to synthesis. Use in efficient, positionally and stereochemically selective C=C bond formation, oxidative hydrolysis of carbonyl compounds. Tetrahedron Lett 1976;17:3-6. 6. Corey EJ, Enders D. Synthetic routes to polyfunctional molecules via metalated N, N-dimethylhydrazones. Tetrahedron Lett 1976;17:11-4. 7. Belskaya NP, Dehaen W, Bakulev VA. Synthesis and properties of hydrazones bearing amide, thioamide and amidine functions. Arch Org Chem 2010;1:275-332. 8. Xavier AJ, Thakur M, Marie JM. Synthesis and spectral characterisation of hydrazone based 14-membered octaaza macrocyclic Ni (II) complexes. J Chem Pharm Res 2012;4:986-90. 9. Banerjee S, Mondal S, Chakraborty W, Sen S, Gachhui R, Butcher RJ, et al. Syntheses, X-ray crystal structures, DNA binding, oxidative cleavage and antimicrobial studies of two Cu (II) hydrazone complees. Polyhedron 2009;28:2785-93. 10. Aslan HG, Özcan S, Karacan N. The antibacterial activity of some sulfonamides and sulfonyl hydrazones, and 2D-QSAR study of a series of sulfonyl hydrazones. Spectrochim Acta A Mol Biomol Spectrosc 2012;98:329-36. 11. Khan SA. Synthesis, characterization and in vitro antibacterial activity of new steroidal 5-en-3-oxazolo and thiazoloquinoxaline. Eur J Med Chem 2008;43:2040-4. 12. Abdel-Wahab BF, Awad GE, Badria FA. Synthesis, antimicrobial, antioxidant, anti-hemolytic and cytotoxic evaluation of new imidazole-based heterocycles. Eur J Med Chem 2011;46:1505-11. 13. Palekar VS, Damle AJ, Shukla SR. Synthesis and antibacterial activity of some novel bis-1,2,4-triazolo[3,4-b]-1,3,4-thiadiazoles and bis-4-thiazolidinone derivatives from terephthalic dihydrazide. Eur J Med Chem 2009;44:5112-6. 14. Wang Y, Yang L, Liu Z. Synthesis and antibacterial activity of 5-(2-Hydroxyphenyl)-1,3,4-thiadiazol-2-yl-sulfanyl acetyl hydrazones. Chin J Org Chem 2013;33:154-8. 15. Babahan I, Coban EP, Biyik H. Synthesis, characterisation and antimicrobial activities of vicdioxime derivatives containing heteroaromatic hydrazone groups and their metal complexes. Maejo Int J Sci Technol 2013;7:26-41. 16. Ozkay Y, Tunali Y, Karaca H, Iþikdað I. Antimicrobial activity and a SAR study of some novel benzimidazole derivatives bearing hydrazone moiety. Eur J Med Chem 2010;45:3293-8. 17. Khalil AM, Berghot MA, Gouda MA. Synthesis and antibacterial activity of some new heterocycles incorporating phthalazine. Eur J Med Chem 2009;44:4448-54. 18. Abdel-Aziz HA, Mekawey AA. Stereoselective synthesis and antimicrobial activity of benzofuran-based (1E)-1-(piperidin-1-yl)-N2-arylamidrazones. Eur J Med Chem 2009;44:4985-97. 19. Bawa S, Kumar S, Drabu S, Kumar R. Synthesis and antimicrobial activity of 2-chloro-6-methylquonoline hydrazone derivatives. J Pharm Bioallied Sci 2009;1:27-31. 20. Sharma RN, Sharma KP, Dikshit SN. Synthesis, characterization and biological activities of some new hypophosphorous adducts of acid hydrazones derived from 2-[(N-benzoyl) 2, 3 dichloroanilido] acetohydrazide. Arch Appl Sci Res 2011;3:415-24. 21. Kendall JD, Rewcastle GW, Frederick R, Mawson C, Denny WA, Marshall ES, et al. 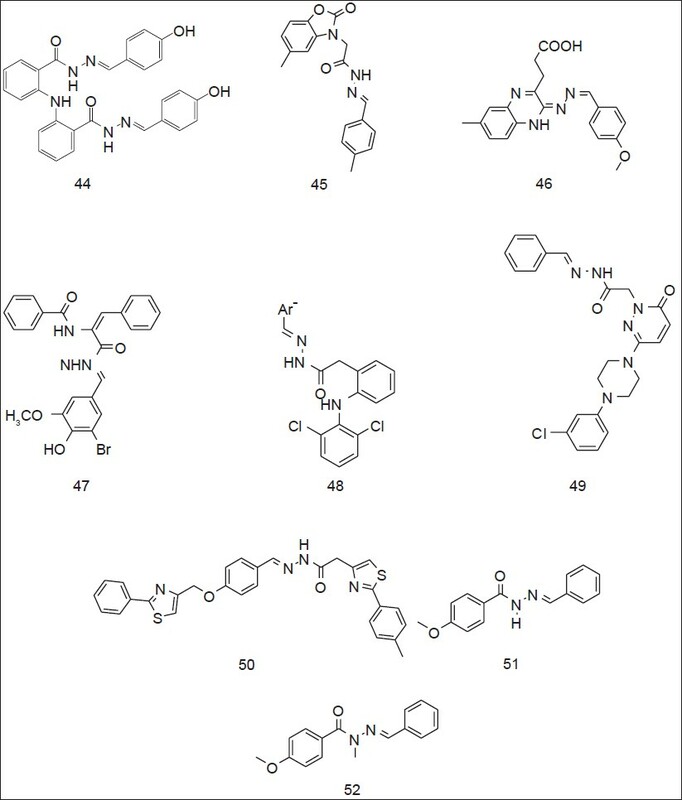 Synthesis, biological evaluation and molecular modelling of sulfonohydrazides as selective PI3K p110alpha inhibitors. Bioorg Med Chem 2007;15:7677-87. 22. Jubie S, Meena S, Ramaseshu KV, Jawahar N, Vijayakumar S. Synthesis and biological evaluation of some hydrazones and carbazones of indane 1,3-dione. Indian J Chem 2010;49B: 1261-3. 23. Govindasami T, Pandey A, Palanivelu N, Pandey A. Synthesis, characterization, and antibacterial activity of biologically important vanillin related hydrazone derivatives. Int J Org Chem 2011;1:71-7. 24. Kamal A, Ahmed SK, Reddy KS, Khan MN, Shetty RV, Siddhardha B, et al. Anti-tubercular agents. Part IV: Synthesis and antimycobacterial evaluation of nitroheterocyclic-based 1,2,4-benzothiadiazines. Bioorg Med Chem Lett 2007;17:5419-22. 25. Raja AS, Agarwal AK, Mahajan N, Pandeya SN, Ananthan S. Antibacterial and antitubercular activity of some diphenyl hydrazones and semicarbazones. Indian J Chem 2010;49B: 1384-8. 26. Telvekar VN, Belubbi A, Bairwa VK, Satardekar K. Novel N'- benzylidene benzofuran-3-carbohydrazide derivatives as antitubercular and antifungal agents. Bioorg Med Chem Lett 2012;22:2343-6. 27. Gemma S, Savini L, Altarelli M, Tripaldi P, Chiasserini L, Coccone SS, et al. Development of antitubercular compounds based on a 4-quinolylhydrazone scaffold. Further structure-activity relationship studies. Bioorg Med Chem 2009;17:6063-72. 28. Mahajan A, Kremer L, Louw S, Guérardel Y, Chibale K, Biot C. Synthesis and in vitro antitubercular activity of ferrocene-based hydrazones. Bioorg Med Chem Lett 2011;21:2866-8. 29. Karali N, Gürsoy A, Kandemirli F, Shvets N, Kaynak FB, Ozbey S, et al. Synthesis and structure-antituberculosis activity relationship of 1H-indole-2,3-dione derivatives. Bioorg Med Chem 2007;15:5888-904. 30. Eswaran S, Adhikari AV, Chowdhury IH, Pal NK, Thomas KD. New quinoline derivatives: Synthesis and investigation of antibacterial and antituberculosis properties. Eur J Med Chem 2010;45:3374-83. 31. Imramovský A, Polanc S, Vinsová J, Kocevar M, Jampílek J, Recková Z, et al. A new modification of anti-tubercular active molecules. Bioorg Med Chem 2007;15:2551-9. 32. Hearn MJ, Cynamon MH, Chen MF, Coppins R, Davis J, Joo-On Kang H, et al. Preparation and antitubercular activities in vitro and in vivo of novel Schiff bases of isoniazid. Eur J Med Chem 2009;44:4169-78. 33. Nayyar A, Jain R. Synthesis and anti-tuberculosis activity of 2,4-disubstituted quinolones. Indian J Chem 2008;47B: 117-28. 34. Turan-Zitouni G, Ozdemir A, Kaplancikli ZA, Benkli K, Chevallet P, Akalin G. Synthesis and antituberculosis activity of new thiazolylhydrazone derivatives. Eur J Med Chem 2008;43:981-5. 35. Nayyar A, Monga V, Malde A, Coutinho E, Jain R. Synthesis, anti-tuberculosis activity, and 3D-QSAR study of 4-(adamantan-1-yl)-2-substituted quinolines. Bioorg Med Chem 2007;15:626-40. 36. Secci D, Bizzarri B, Bolasco A, Carradori S, D'Ascenzio M, Rivanera D, et al. Synthesis, anti-Candida activity, and cytotoxicity of new (4-(4-iodophenyl) thiazol-2-yl) hydrazine derivatives. Eur J Med Chem 2012;53:246-53. 37. Maillard LT, Bertout S, Quinonéro O, Akalin G, Turan-Zitouni G, Fulcrand P, et al. Synthesis and anti-Candida activity of novel 2-hydrazino-1,3-thiazole derivatives. Bioorg Med Chem Lett 2013;23:1803-7. 38. Altýntop MD, Özdemir A, Turan-Zitouni G, Ilgýn S, Atlý Ö, Ýþcan G, et al. Synthesis and biological evaluation of some hydrazone derivatives as new anticandidal and anticancer agents. Eur J Med Chem 2012;58:299-307. 39. Chimenti F, Bizzarri B, Maccioni E, Secci D, Bolasco A, Fioravanti R, et al. Synthesis and in vitro activity of 2-thiazolylhydrazone derivatives compared with the activity of clotrimazole against clinical isolates of Candida spp. Bioorg Med Chem Lett 2007;17:4635-40. 40. Kocyigit-Kaymakcioglu B, Oruc-Emre EE, Unsalan S, Tabanca N, Khan SI, Wedge DE, et al. Synthesis and biological activity of hydrazide-hydrazones and their corresponding 3-acetyl-2,5-disubstituted-2,3-dihydro-1,3,4-oxadiazoles. Med Chem Res 2012;21:3499-508. 41. el-Sabbagh OI, Rady HM. Synthesis of new acridines and hydrazones derived from cyclic beta-diketone for cytotoxic and antiviral evaluation. Eur J Med Chem 2009;44:3680-6. 42. Tian B, He M, Tang S, Hewlett I, Tan Z, Li J, et al. Synthesis and antiviral activities of novel acylhydrazone derivatives targeting HIV-1 capsid protein. Bioorg Med Chem Lett 2009;19:2162-7. 43. Mohamed Eissa AA, Soliman GA, Khataibeh MH. Design, synthesis and anti-inflammatory activity of structurally simple anthranilic acid congeners devoid of ulcerogenic side effects. Chem Pharm Bull (Tokyo) 2012;60:1290-300. 44. Salgin-Gökºen U, Gökhan-Kelekçi N, Göktaº O, Köysal Y, Kiliç E, Iºik S, et al. 1-Acylthiosemicarbazides, 1,2,4-triazole-5 (4H)-thiones, 1,3,4-thiadiazoles and hydrazones containing 5-methyl-2- benzoxazolinones: Synthesis, analgesic-anti-inflammatory and antimicrobial activities. Bioorg Med Chem 2007;15:5738-51. 45. Khan KM, Khan M, Ali M, Taha M, Rasheed S, Perveen S, et al. Synthesis of bis-Schiff bases of isatins and their antiglycation activity. Bioorg Med Chem 2009;17:7795-801. 46. Rajitha G, Saideepa N, Praneetha P. Synthesis and evaluation of N-(α-benzamidocinnamoyl) aryl hydrazone derivative for anti-inflammatory and antioxidant activities. Indian J Chem 2011;50B: 729-33. 47. Bhandari SV, Bothara KG, Raut MK, Patil AA, Sarkate AP, Mokale VJ. Design, synthesis and evaluation of antiinflammatory, analgesic and ulcerogenicity studies of novel S-substituted phenacyl-1,3,4-oxadiazole-2-thiol and Schiff bases of diclofenac acid as nonulcerogenic derivatives. Bioorg Med Chem 2008;16:1822-31. 48. Gökçe M, Utku S, Küpeli E. Synthesis and analgesic and anti-inflammatory activities 6-substituted-3 (2H)-pyridazinone-2-acetyl-2-(p-substituted/nonsubstituted benzal) hydrazone derivatives. Eur J Med Chem 2009;44:3760-4. 49. Moldovan CM, Oniga O, Pârvu A, Tiperciuc B, Verite P, Pîrna¢u A, et al. Synthesis and anti-inflammatory evaluation of some new acyl-hydrazones bearing 2-aryl-thiazole. Eur J Med Chem 2011;46:526-34. 50. Kümmerle AE, Vieira MM, Schmitt M, Miranda AL, Fraga CA, Bourguignon JJ, et al. Design, synthesis and analgesic properties of novel conformationally-restricted N-acylhydrazones (NAH). Bioorg Med Chem Lett 2009;19:4963-6. 51. Dandawate P, Khan E, Padhye S, Gaba H, Sinha S, Deshpande J, et al. Synthesis, characterization, molecular docking and cytotoxic activity of novel plumbagin hydrazones against breast cancer cells. Bioorg Med Chem Lett 2012;22:3104-8. 52. Mohareb RM, Al-Omran F. Reaction of pregnenolone with cyanoacetylhydrazine: Novel synthesis of hydrazide-hydrazone, pyrazole, pyridine, thiazole, thiophene derivatives and their cytotoxicity evaluations. Steroids 2012;77:1551-9. 53. Aydýn S, Kaushik-Basu N, Arora P, Basu A, Nichols BD, Talele TT, et al. Microwave assisted synthesis of some novel flurbiprofen hydrazidehydrazones as anti-HCV NS5B and anti-cancer agents. Marmara Pharm J 2013;17:26-34. 54. Cui Z, Li Y, Ling Y, Huang J, Cui J, Wang R, et al. New class of potent antitumor acylhydrazone derivatives containing furan. Eur J Med Chem 2010;45:5576-84. 55. Al-Said MS, Bashandy MS, Al-Qasoumi SI, Ghorab MM. Anti-breast cancer activity of some novel 1,2-dihydropyridine, thiophene and thiazole derivatives. Eur J Med Chem 2011;46:137-41. 56. Liu T, Sun C, Xing X, Jing L, Tan R, Luo Y, et al. Synthesis and evaluation of 2-[2-(phenylthiomethyl)-1H-benzo[d] imidazol-1-yl) acetohydrazide derivatives as antitumor agents. Bioorg Med Chem Lett 2012;22:3122-5. 57. Vogel S, Kaufmann D, Pojarová M, Müller C, Pfaller T, Kühne S, et al. Aroyl hydrazones of 2-phenylindole-3-carbaldehydes as novel antimitotic agents. Bioorg Med Chem 2008;16:6436-47. 58. Xu G, Abad MC, Connolly PJ, Neeper MP, Struble GT, Springer BA, et al. 4-Amino-6-arylamino-pyrimidine-5-carbaldehyde hydrazones as potent ErbB-2/EGFR dual kinase inhibitors. Bioorg Med Chem Lett 2008;18:4615-9. 59. Benites J, Valderrama JA, Rivera F, Rojo L, Campos N, Pedro M, et al. Studies on quinones. Part 42: Synthesis of furylquinone and hydroquinones with antiproliferative activity against human tumor cell lines. Bioorg Med Chem 2008;16:862-8. 60. Hayakawa M, Kawaguchi K, Kaizawa H, Koizumi T, Ohishi T, Yamano M, et al. Synthesis and biological evaluation of sulfonylhydrazone-substituted imidazo[1,2-a] pyridines as novel PI3 kinase p110alpha inhibitors. Bioorg Med Chem 2007;15:5837-44. 61. Zheng LW, Wu LL, Zhao BX, Dong WL, Miao JY. Synthesis of novel substituted pyrazole-5-carbohydrazide hydrazone derivatives and discovery of a potent apoptosis inducer in A549 lung cancer cells. Bioorg Med Chem 2009;17:1957-62. 62. Xia Y, Fan CD, Zhao BX, Zhao J, Shin DS, Miao JY. Synthesis and structure-activity relationships of novel 1-arylmethyl-3-aryl- 1H-pyrazole-5-carbohydrazide hydrazone derivatives as potential agents against A549 lung cancer cells. Eur J Med Chem 2008;43:2347-53. 63. Gürsoy E, Güzeldemirci NU. Synthesis and primary cytotoxicity evaluation of new imidazo[2,1-b] thiazole derivatives. Eur J Med Chem 2007;42:320-6. 64. Despaigne AA, Parrilha GL, Izidoro JB, da Costa PR, dos Santos RG, Piro OE, et al. 2-Acetylpyridine-and 2-benzoylpyridine-derived hydrazones and their gallium (III) complexes are highly cytotoxic to glioma cells. Eur J Med Chem 2012;50:163-72. 65. Salgin-Gökºen U, Gökhan-Kelekçi N, Yabanoglu-Çiftci S, Yelekçi K, Uçar G. Synthesis, molecular modeling, and in vitro screening of monoamine oxidase inhibitory activities of some novel hydrazone derivatives. J Neural Transm 2013;120:883-91. 66. Cutshall NS, Onrust R, Rohde A, Gragerov S, Hamilton L, Harbol K, et al. Novel 2-methoxyacylhydrazones as potent, selective PDE10A inhibitors with activity in animal models of schizophrenia. Bioorg Med Chem Lett 2012;22:5595-9. 67. Kulandasamy R, Adhikari AV, Stables JP. A new class of anticonvulsants possessing 6 Hz activity: 3,4-dialkyloxy thiophene bishydrazones. Eur J Med Chem 2009;44:4376-84. 68. de Oliveira KN, Costa P, Santin JR, Mazzambani L, Bürger C, Mora C, et al. Synthesis and antidepressant-like activity evaluation of sulphonamides and sulphonyl-hydrazones. Bioorg Med Chem 2011;19:4295-306. 69. Gökhan-Kelekçi N, Koyunoðlu S, Yabanoðlu S, Yelekçi K, Ozgen O, Uçar G, et al. New pyrazoline bearing 4 (3H)-quinazolinone inhibitors of monoamine oxidase: Synthesis, biological evaluation, and structural determinants of MAO-A and MAO-B selectivity. Bioorg Med Chem 2009;17:675-89. 70. Siddiqui SM, Salahuddin A, Azam A. Synthesis, characterization and antiamoebic activity of some hydrazone and azole derivatives bearing pyridyl moiety as a promising heterocyclic scaffold. Eur J Med Chem 2012;49:411-6. 71. Gerpe A, Alvarez G, Benítez D, Boiani L, Quiroga M, Hernández P, et al. 5-Nitrofuranes and 5-nitrothiophenes with anti-Trypanosoma cruzi activity and ability to accumulate squalene. Bioorg Med Chem 2009;17:7500-9. 72. Caputto ME, Fabian LE, Benítez D, Merlino A, Ríos N, Cerecetto H, et al. Thiosemicarbazones derived from 1-indanones as new anti-Trypanosoma cruzi agents. Bioorg Med Chem 2011;19:6818-26. 73. Carvalho SA, Feitosa LO, Soares M, Costa TE, Henriques MG, Salomão K, et al. Design and synthesis of new (E)-cinnamic N-acylhydrazones as potent antitrypanosomal agents. Eur J Med Chem 2012;54:512-21. 74. dos Santos Filho JM, Leite AC, de Oliveira BG, Moreira DR, Lima MS, Soares MB, et al. Design, synthesis and cruzain docking of 3-(4-substituted-aryl)-1,2,4-oxadiazole-N-acylhydrazones as anti-Trypanosoma cruzi agents. Bioorg Med Chem 2009;17:6682-91. 75. Porcal W, Hernández P, Boiani L, Boiani M, Ferreira A, Chidichimo A, et al. New trypanocidal hybrid compounds from the association of hydrazone moieties and benzofuroxan heterocycle. Bioorg Med Chem 2008;16:6995-7004. 76. de Aquino TM, Liesen AP, da Silva RE, Lima VT, Carvalho CS, de Faria AR, et al. Synthesis, anti-Toxoplasma gondii and antimicrobial activities of benzaldehyde 4-phenyl-3-thiosemicarbazones and 2-[(phenylmethylene) hydrazono]-4-oxo-3-phenyl-5-thiazolidineacetic acids. Bioorg Med Chem 2008;16:446-56. 77. Caputto ME, Ciccarelli A, Frank F, Moglioni AG, Moltrasio GY, Vega D, et al. 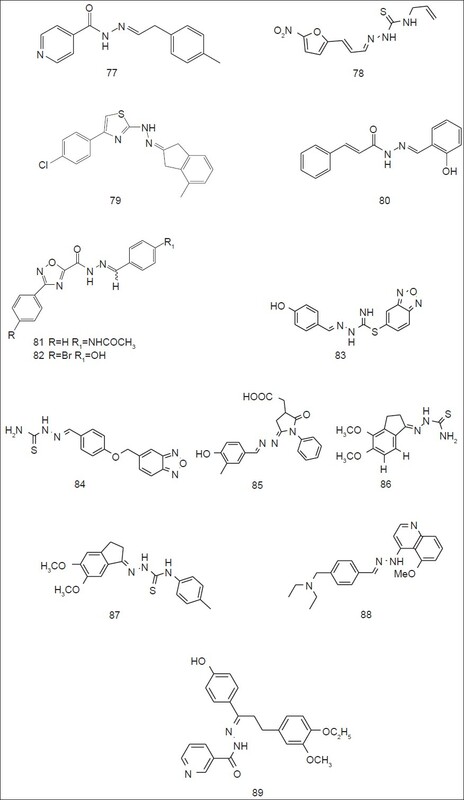 Synthesis and biological evaluation of some novel 1-indanone thiazolylhydrazone derivatives as anti-Trypanosoma cruzi agents. Eur J Med Chem 2012;55:155-63. 78. Fattorusso C, Campiani G, Kukreja G, Persico M, Butini S, Romano MP, et al. Design, synthesis, and structure-activity relationship studies of 4-quinolinyl-and 9-acrydinylhydrazones as potent antimalarial agents. J Med Chem 2008;51:1333-43. 79. Acharya BN, Saraswat D, Kaushik MP. Pharmacophore based discovery of potential antimalarial agent targeting haem detoxification pathway. Eur J Med Chem 2008;43:2840-52. 80. Bi W, Cai J, Liu S, Baudy-Floc'h M, Bi L. Design, synthesis and cardioprotective effect of a new class of dual-acting agents: Phenolic tetrahydro-beta-carboline RGD peptidomimetic conjugates. Bioorg Med Chem 2007;15:6909-19. 81. Leal CM, Pereira SL, Kümmerle AE, Leal DM, Tesch R, de Sant'Anna CM, et al. Antihypertensive profile of 2-thienyl-3,4-methylenedioxybenzoylhydrazone is mediated by activation of the A2A adenosine receptor. Eur J Med Chem 2012;55:49-57. 82. Mashayekhi V, Haj Mohammad Ebrahim Tehrani K, Amidi S, Kobarfard F. Synthesis of novel indole hydrazone derivatives and evaluation of their antiplatelet aggregation activity. Chem Pharm Bull (Tokyo) 2013;61:144-50. 83. Lima LM, Frattani FS, Dos Santos JL, Castro HC, Fraga CA, Zingali RB, et al. Synthesis and anti-platelet activity of novel arylsulfonate - Acylhydrazone derivatives, designed as antithrombotic candidates. Eur J Med Chem 2008;43:348-56. 25 2, 2'-Dihydroxybenzophenones and Derivatives. Efficient Synthesis and Structure Endoscopy by DFT and NMR. Credentials as Potent Antiinflammatory Agents.